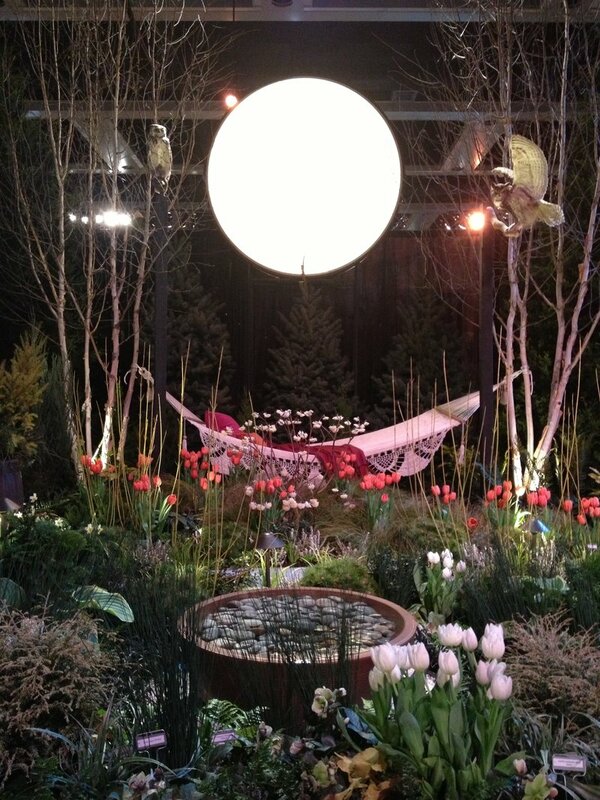 Spring is coming soon and so is the Northwest Flower & Garden Show! 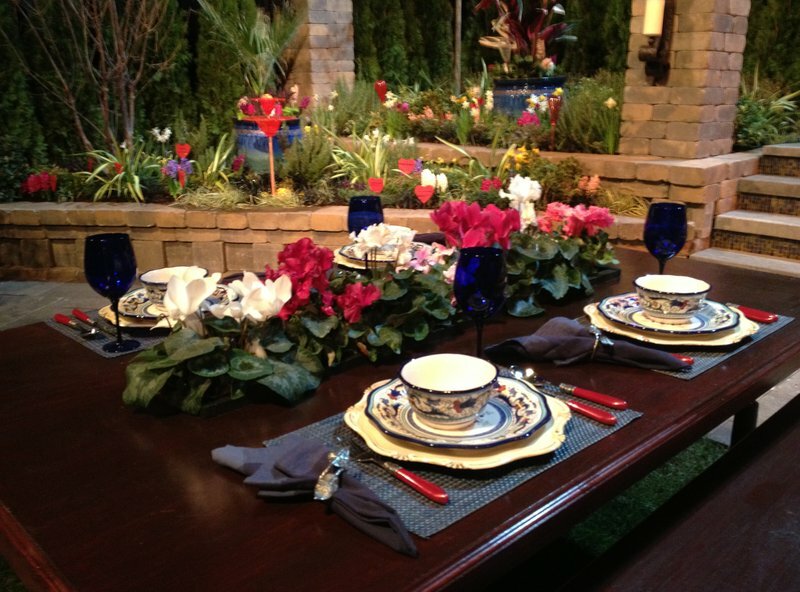 Northwest Flower & Garden Show is here this week! 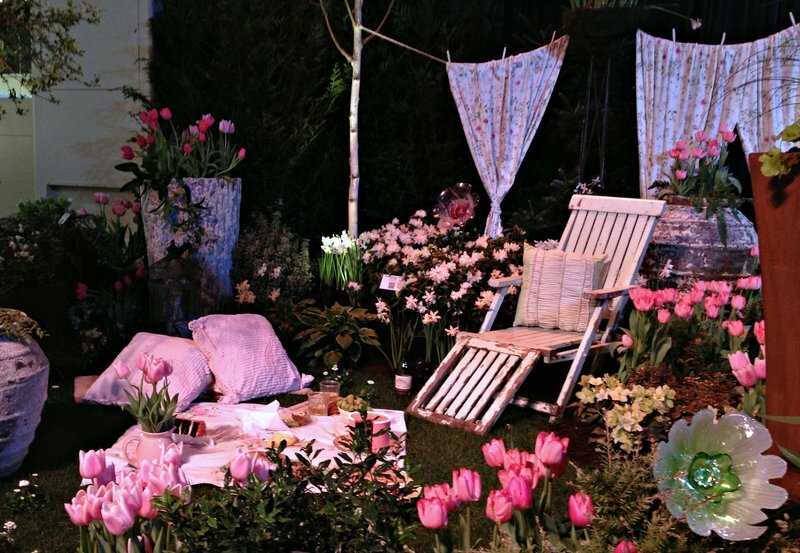 The Northwest Flower & Garden Show is just the thing to inspire you when the cold, gray, and drizzly days of Seattle and Puget Sound have been pummelling you down. This year the dates for the show are February 17th to the 21st, 2016 as usual at the Seattle Convention Center. I have been many times since I moved to Seattle and it is always a joy to walk in and see the amazing display gardens, the color, the design, the whimsey, the fragrance and the beauty! 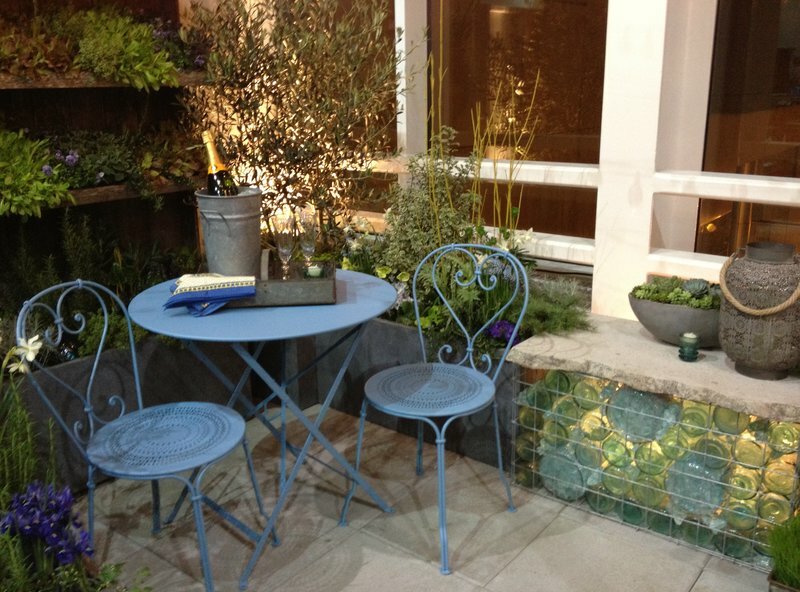 So many ideas in the display gardens and the marketplace with wondrous things for your garden and home – I love it! 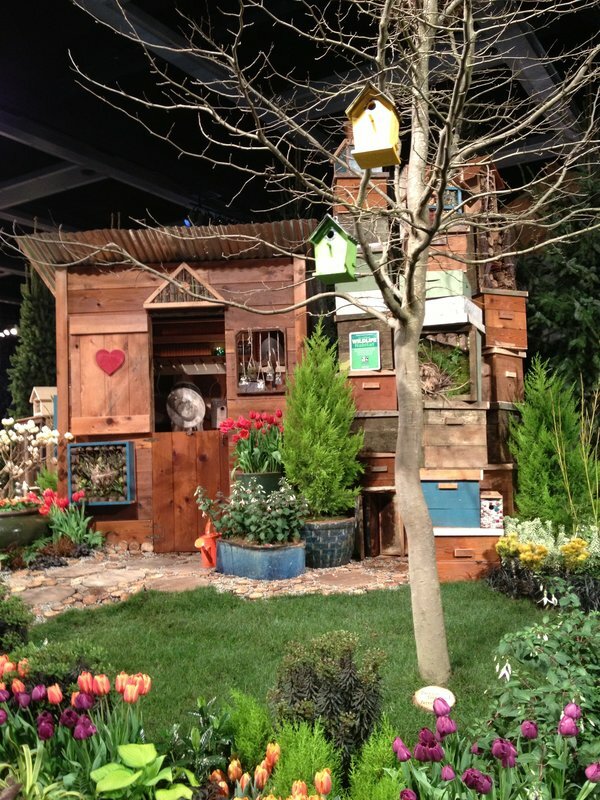 At the NWF&GS, there are many gardening lectures to learn and inspire, and the first time I attended the show, I was still an apartment dweller. I had been gardening in pots on balconies for years and wanted to learn how to make a garden in the house I was planning on buying in Seattle and was just itching to make a garden! I have learned so much over the years at the Northwest Flower & Garden Show and love talking about how much I have learned and been inspired by it. You can get ideas for making your patio a truly beautiful extension of your home, especially with all the outdoor dining ideas. 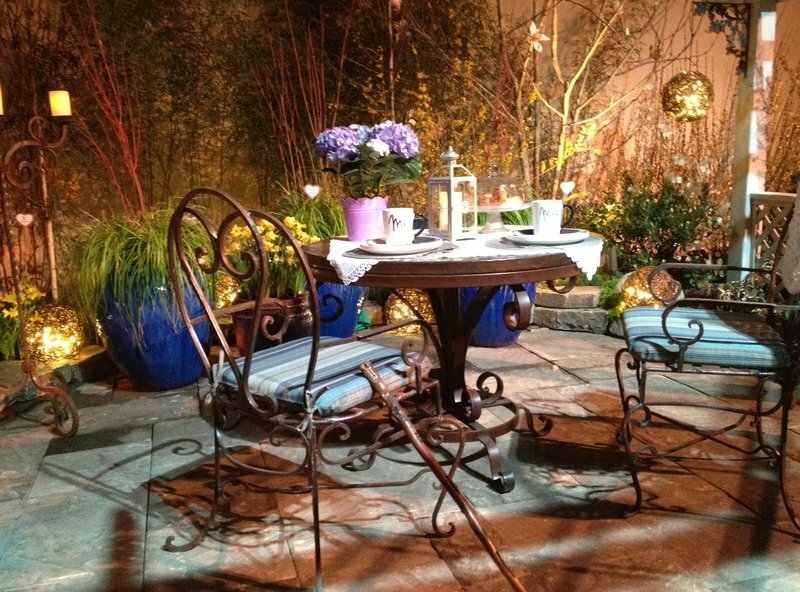 Even if your outdoor space is small, there are wonderful ideas to make it a truly beautiful area. If you are planning on having a garden or wishing to enhance the one you have, this is the place to go! This year’s theme is America The Beautiful, I am planning on being there this coming Friday with a gardening (and artist) friend and I am really looking forward to seeing the all the joyful colors. Real Estate on your mind? Would you like someone to represent YOU, someone who is knowledgeable with the expertise to assist you with your largest financial decision? I can help, I take great care of my clients, I will take great care of you! Contact me and we can talk about how I can help you. Deborah.Burns.Seattle@gmail.com or call me at 206-618-0565. 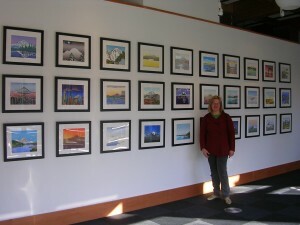 Walking into the Kinsey Gallery with Kristina Hagman and seeing a wall of 30 views of Mt Rainier was as awesome as suddenly seeing Mt Rainier as you drive, boat, walk, hike or move around Seattle and the Puget Sound…. *SMAK*…and there they are! Kristina Hagman whose woodblock print “Night” was on the DANIEL SMITH 2009-2010 Reference Catalog had her entire suite of “36 Views of Mt Rainier” on display at the Kinsey Gallery at Seattle University. Unfortunately I missed her Artist Reception, but Kristina was kind enough to meet at the Gallery (the exhibit was March, 2010) and talk with me again about her work. I originally met Kristina at her home/studio to talk about her “Thirty-Six Views of Mount Rainier” woodblock prints inspired by Hokusai and his series Thirty-Six Views of Mount Fuji while she was still working on them. You can read that interview here: “An hour with Kristina Hagman, DANIEL SMITH Catalog Cover Artist, to chat about her Woodblock Print Series ‘Thirty-Six Views of Mount Rainier“. The entry print is my favorite, “View from Georgetown“, then you come around the corner and there they are…you see 30 prints arranged “en masse” with 5 more prints opposite as you walk in. 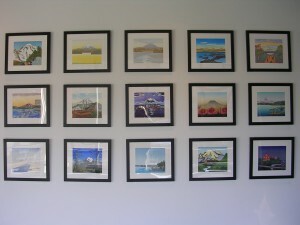 Those 5 prints are of Mt Rainier alone…. almost as an abstraction…without the context of a foreground to provide a narrative. Kristina described them as Mt Rainier as “Superstar” and to her, as if Mt Rainier was featured on the cover of “Andy Warhol’s Interview magazine”. These are also named differently with titles like Big Rainier Opal” and “Dark Big Rainier“. The narratives of the the other 31 one prints are as changeable as the mountain is, as unique as the Seattle neighborhood (or outlying location) from which that particular view of Mt Rainier is seen. Sometimes it’s from a single persons point of view like “Diane’s View” or Axel’s View“. In several you see strong forced perspective as a pink flowering Cherry Tree lined “Rainier Avenue South“ points to Mt Rainier or “View from Beacon Hill” with the Power Lines marching along towards Mt Rainier. This print was one that Kristina was carving when I visited her studio, you can see a photo of her carving it here. While there is an identifiable point of view location to most of the prints, Kristina has edited and manipulated the images to suit her personal point of view of Mt Rainier, which is sometimes very surreal and dramatic as seen in “View from Date Night“, very urban views of Mt Rainier like “Amazon” and “View from Tacoma” which contrast to the more naturalized urban views in prints like “Blue Heron” and “View from Seward Park” and the views of Mt Rainier in a landscape like”Reflection” and “Winter“. Living in Puget Sound means living in the presence of Mt Rainier and experiencing it from so many places, it’s something you always see, like the sky. You are always seeing in framed by the foreground of where-you-are-right-now. Sometimes Mt Rainier looms large, sometimes barely seen, sometimes rose colored with alpine glow from the rising or setting sun, sometimes obscured by clouds soon to be revealed and always there. Kristina Hagman’s “36 Views of Mt Rainier” woodblock series captures 36 interpretive views that everyone in living in the shadow of the Mountain can recognize. Wonderful body of work! Note to readers: I met Kristina Hagman at her Gallery Show at the Kinsey Gallery in March, 2010 and originally wrote this for the DANIEL SMITH Blog. I am now publishing it here on my own blog as it was the second of my artist interviews.